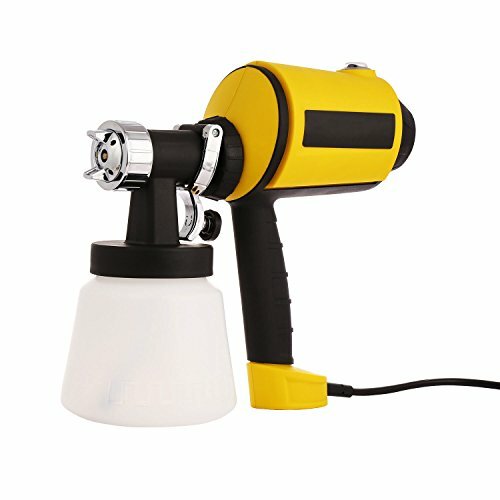 For this post, I have put together a collection of the best paint sprayers currently available. Whether you are working on renovating your home or tackling your latest DIY project, these sprayers with help you get the job done fast. The following paint sprayers use quality components to ensure you do your best work. So here is my list of The 10 Best Paint Sprayers. Fully adjustable pressure to give you ultimate control of paint flow for any project size. Flexible suction tube allows you to spray directly from a 1 or 5 gallon paint bucket. Annual use recommendation is up to 125 gallons per year. PowerFlush Adapter connects to a garden hose for fast and easy cleaning. 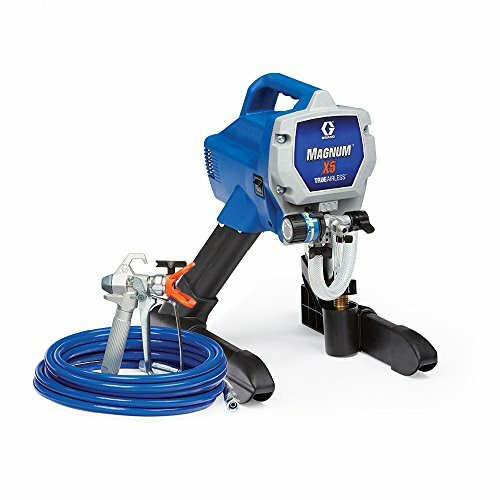 Can support up to 75 ft of paint hose giving you extra reach for your projects. RAC IV SwitchTip allows you to reverse the tip when clogged to keep you spraying. 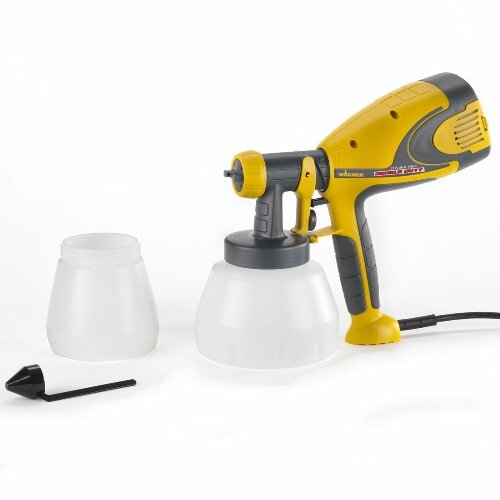 The Wagner Control Spray Max combines variable air pressure control, a metal spray gun, and a powerful two-stage turbine to make it easier to paint walls and surfaces with latex paints and thinner materials, like lacquers and stains. Lock-n-Go front end makes material changes quick and easy. Includes two air filters that protect the finish from dust. Variable air pressure control (1.50 to 2.63 psi) reduces overspray of thin materials like lacquers and stains. Variable flow control allows you to transition from working with a large spray surface to more detail-oriented projects, like painting trim or windowpanes. The spray nozzle requires only a simple turning of the ears on the air cap to allow for a round, horizontal, or vertical pattern, depending on your application. Two large air filters prevent dust from marring the finish, so the result is smooth and even. And with the 20-foot air hose, it's easy to keep the spray gun positioned squarely towards your surface. Includes a contractor-grade, 1-quart metal cup, as well as a 1-1/2 quart plastic cup for larger volume jobs. 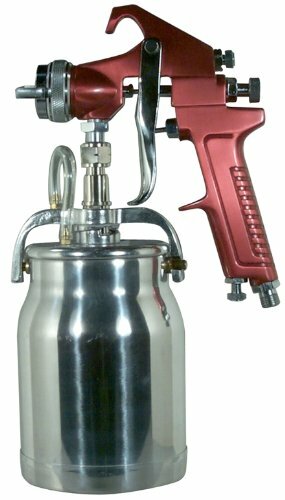 400 watt electric paint sprayer, sprays thicker paints with less thinning required and 27-ounce container capacity to hold more paint. Three spray pattern settings (vertical, horizontal and round). The air cap creates a concentrated air flow to get more paint to the surface. At only a couple pounds the Finish Max fits perfectly in your hands and keeps you spraying longer without fatigue. 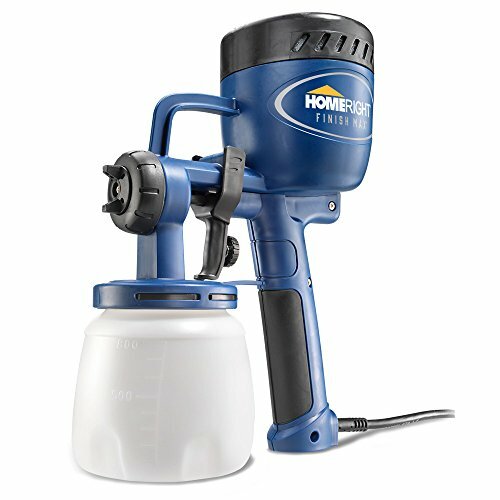 HVLP Paint Sprayer to upcycle countless painting or staining projects. Spray oil or water based materials such as: chalk type paint, milk paint, latex paints, enamels, primers, clear sealer, polyurethane, stain and varnish. The Wagner Control Spray Double Duty uses HVLP (High Volume Low Pressure) air power technology to spray thin materials such as stains, sealers, urethanes, varnishes and lacquers. 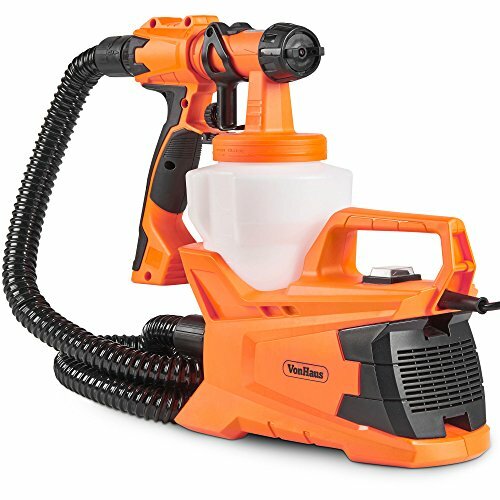 Features a two-stage indoor/outdoor-rated air turbine for a continuous flow of material and air, producing a professional fine finish whether staining your deck or refinishing your kitchen cabinets. A three-position air cap adjusts the spray pattern for either vertical fan, horizontal fan or round pattern shapes to most effectively get the job done quickly and with the best even coverage. Material flow is easily controlled with the variable trigger and allows the user to spray ½-inch to 9-inch wide patterns. Sets up in less than five minutes and cleans up in less than ten. large 35 fl. Oz. capacity contributes to painting speed by reducing the need for frequent refills. Can spray paint up to 60 Din-S viscosity. The spray pattern shape is adjusted by rotating the spray pattern adjuster to either the vertical, horizontal or diagonal positions. 450 watts of power, the Super Finish Max Paint Sprayer can handle thicker paints and varnishes which means no thinning. 6 available spray tips (3 included), you can tackle a wide variety of projects. 39 fluid ounce container enables you to spray larger projects without having to refill as often, saving you time. Self contained spraying unit; no compressor required. Uses precision brass spray tips and nozzles, which provide superior performance over their plastic counterparts. Sprayer atomizes paint into tiny particles which is necessary for a fine factory-like finish. HVLP (High Volume Low Pressure) provides low overspray technology with three spray patterns control. 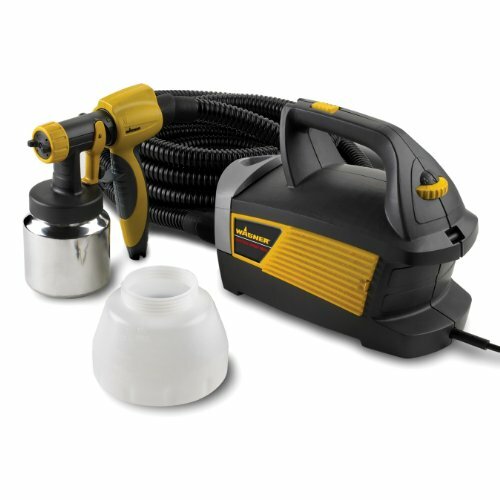 Equipped with 1.88mm brass nozzle to spray thin materials such as stains, varnishes, and lacquers. Powerful and lightweight, this sprayer is very user-friendly. 700ml/min, sprayed more faster and evenly than using a brush or roller. Perfect for interior walls, edges, corners and broad interior surfaces. Easy to use, simply squeeze the trigger and you're ready to spray. Horizontal flat jet, vertical flat jet and circular jet can be adjusted. Choose the pattern according to your needs by rotating the collar. Three nozzles with different diameters (1.5mm/ 1.8mm/ 2.5mm) are designed for wide range of uses. Adjustable Volume Regulator to adjust the flow rate for coating speed and project size for precise paint applications. Portable and anti-slip design with ergonomic grip. All parts are removable, so you can clean it conveniently. Wide Application with less thinning and higher efficiency. 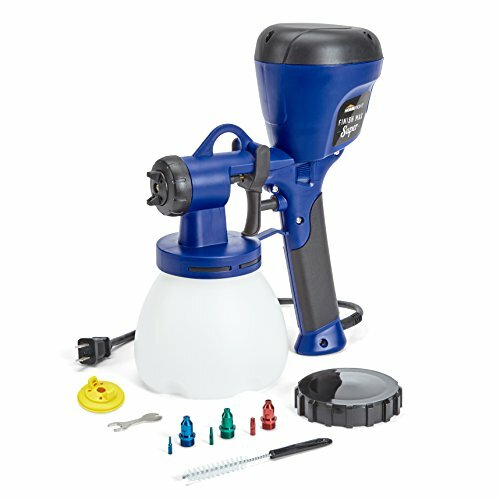 All-purpose easy-to-clean paint spray gun. Two-piece construction with gun featuring exclusive air valve design. From primers to tops coats, acrylics to contact cement, and car doors to picket fences and interior doors - the 4008 sprays nearly everything on almost anything. Adjust up to an 11" fan size from an 8" distance, cutting job times and providing clean, even coverage that a brush just can't match. 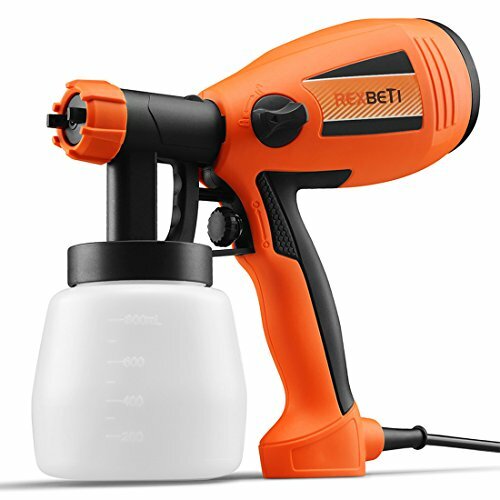 Hold gun at any angle with various fill levels while maintaining proper suction and without spilling paint from canister. 1 quart capacity dripless cup. 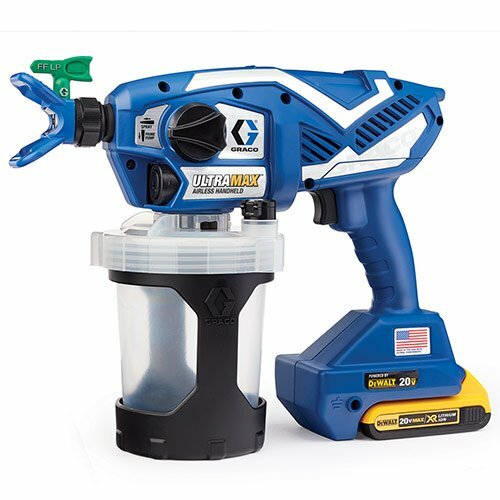 Cordless and airless for complete painting freedom. Precision pressure control that delivers a consistent spray fan without pressure fluctuations. Compatible with any DEWALT 20V Lithium Ion battery . Spray up to one gallon with each charge. Sprays hot liquids such as solvent-based lacquers. Sprays water, solvent and flammable based materials. Durable and lightweight design: stainless steel and carbide components bonded with a high strength polymers. I hope this list of the best paint sprayer was helpful.